She had soulful eyes. Her face was an effortless kind of pretty, accented by a sunny-bright smile and a soft, suede complexion. But in all of the photos of Cherica Adams—those throwback pictures of her with beehived, sky-touching hair, the signature style of the ’90s that she’d have probably rather forgotten she’d worn, and the ones of her a little older, more adult, sharing her joy as she holds up her T-shirt to show off the slightest whiff of a baby bump—her eyes pull at your eyes. They draw you in to her story. She’d invested three years toward a communications degree from Winston-Salem State University before she transferred to the University of North Carolina at Charlotte. While she was there, a cousin, already established in the business of selling real estate, suggested Cherica give it a shot. She did, and became one of the youngest agents for one of the foremost builders in the city, and was in the multimillion-dollar club after her first year. She’d also done some modeling and made some appearances in movies like House Party 3. She was navigating a life quickly unfolding in her favor. Today, Cherica would be 40 years old. She’s not smiling her sunny-bright smile or filling a room with her effervescent energy. There won’t be any gift-giving or off-key singing or party-throwing. It’s her birthday, but it’s not wholly a celebration because she’s not here to celebrate it. 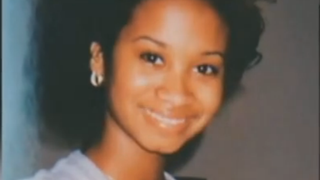 In 1999 she was shot by Van Brett Watkins, hired by then-Carolina Panthers running back Rae Carruth because he didn’t want her to birth the baby they’d created together. The baby Cherica had been carrying for eight months. The baby to whom she’d been reading the Bible and playing classical music. The baby who was already demonstrating in the womb that he’d inherited his mother’s spirited nature. Carruth saw the child as a liability rather than a gift, and as part of his plot to avoid responsibility at any cost, he blocked the roadway Cherica was driving with his Ford Expedition, allowing Watkins to pull alongside her BMW and fire five shots into the driver’s side. Four hit her body. Three were wounds. One was fatal. It penetrated her left side, tore through her stomach, ripped her intestines, punctured her lung, severed her pancreas and cut her splenic artery, immediately causing her to start bleeding out. Able to dial 911, Cherica was just worried about her baby. Now that baby boy, Chancellor, reminds Cherica’s mother daily of the daughter who was so excited about becoming a mother herself. “He looks like her and he definitely has that beautiful smile. Chancellor wakes up in the morning with a smile and he goes to bed at night with a smile. That is so Cherica,” she said. “That night she was out there determined to let us know she’d been shot and she needed to get to the hospital. She was definitely taking care of her child,” she said. The media and the public devour sensational cases, particularly when they involve a public figure, and bore quickly of them when the details have been picked down to the bones. There are people at the center of these stories, though, and sometimes—oftentimes—their humanity gets lost inside the churn to produce news, increase readership, move on. Something about Cherica Adams’ life resonates with me, maybe because she was young and ambitious and, by her mother’s description, friendly and bubbly. Maybe because she fell in love with the wrong dude, which I’ve done myself four hard-learned times. Maybe because it’s important to me to connect with a few stories that allow me to feel rather than be desensitized by shock value, one post more jarring than the last. Our lives deserve more than to be disposable headlines. This would’ve been a milestone age for Cherica, one many women hate to see approaching because of vanity or achievement hang-ups or age-related stigma. Nobody wants to be old except for the people who will never get a chance to be old. Cherica, her mother said, accomplished everything she wanted to get done in her life except get married. So happy birthday, Cherica. I hope your spirit dances across places where your feet didn’t get a chance to go.